Burger - Paninis- Pasta There are 11 products to choose from. Takeaway Lanzarote - Restaurants Playa Blanca Chicken Paninis with Tomato, Salad and Mayonesa. Takeaway Lanzarote - Restaurants Playa Blanca Cheeseburger with Bacon , egg, salad, tomato, onion. 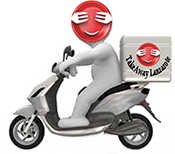 Burger Delivery Playa Blanca - Burger Places Lanzarote - Best Burger Takeaway.